Ombre, technically ombré, is everywhere these days. It is an absolutely massive trend. We’re seeing it in everything from clothing to hair dye. It is showing up all over the crafting world, and guess what? We are also seeing it in décor—no surprise there. Just in case you’ve been living under a rock over the past couple years, “ombre” is a French word which translates to “shaded.” That is a perfect description of what it means. When something is described as “ombre,” it means that it contains a transitional series of hues blending seamlessly from one to the next. Usually these will all be hues of the same color, blending from darker to lighter shades. Sometimes, however, ombre may contain different colors. The most important thing is that they fade smoothly into each other without clashing at any point along the way. Ombre is a relatively new trend which may have gotten started around the year 2000. It really has only risen to prominence though over the past few years, however. By now, there is a pretty good chance you have seen ombre décor for sale at the store, or encountered someone wearing ombre makeup or hair dye. Maybe you even spotted an ombre cake at the most recent wedding you attended. Incorporating ombre into your home décor can provide you with an eye-catching effect. It’s a great way of adding color to your interior without overwhelming it or clashing in any way with any of your existing decor. It creates a smooth, minimalist look, and while it works well with bold hues, it is particularly striking with pastels. This can also work nicely in conjunction with the “all white” design trend which is popular right now. If most of your décor is white, a few items which smoothly transition in and out of various pastels can help break up that white and define your space without disrupting that soft elegance you are trying to cultivate. Looking for some exciting ombre projects to decorate your own space? In this list, I have gathered 50 beautiful décor ideas which are sure to flatter any home! 2. Dreamy walls in pink. 3. Paint your dresser drawers with ombre hues. 4. Even your kitchen utensils look better in ombre. 5. 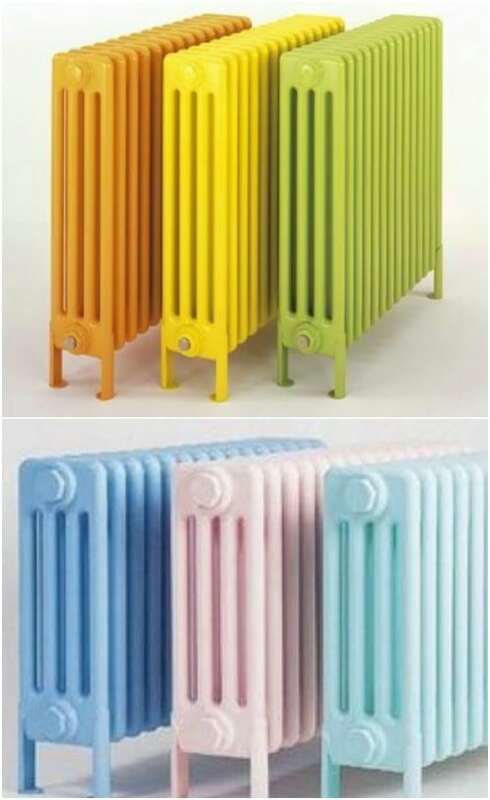 You can even paint your radiator in ombre. 6. 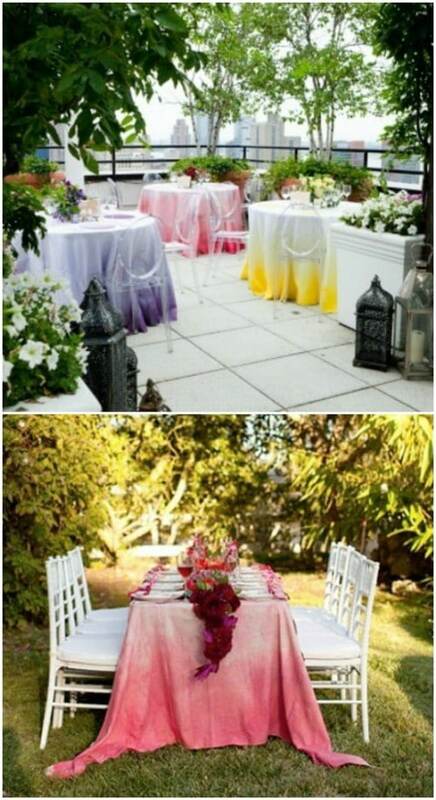 Ombre also can be used for wedding décor. 7. These ombre walls evoke the ocean. 8. Ombre can create stunning contrasts. 9. Use ombre to make a design stand out. 10. Soft pastel gradients make for lovely walls. 11. Look for the golden lining. 12. 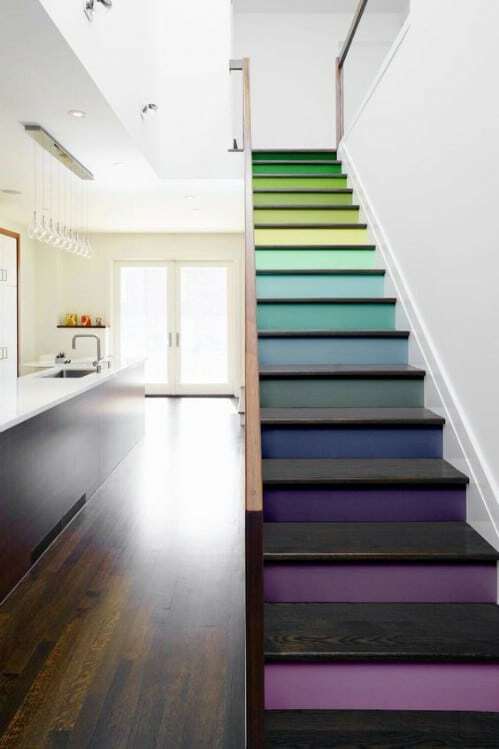 Turn your staircase into a rainbow. 13. Get some useful how-to advice. 14. Gray ombre tones can be particularly eye-catching. 15. Go with a distressed wood look. 16. Just paint each of your chairs a slightly different color. 17. This set of drawers is evocative of the beach. 18. 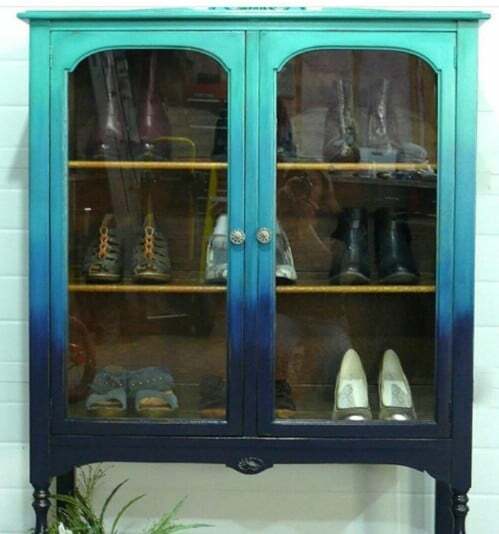 You can also paint a glass display cabinet. 19. Teal is extremely popular these days. 20. Sometimes bold and bright really works. 21. Use masking tape to create a design. 22. 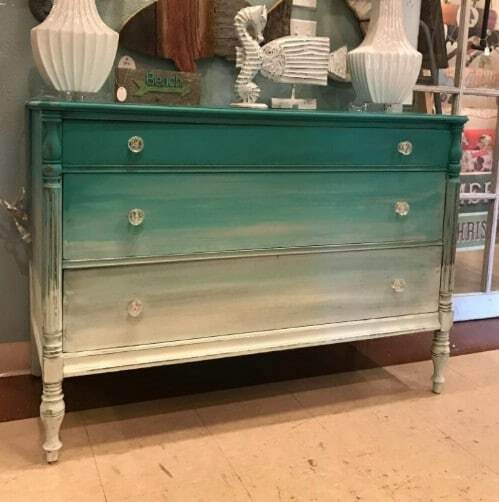 Here is yet another gorgeous teal ombre dresser. 23. Try dip-dying your curtains. 24. 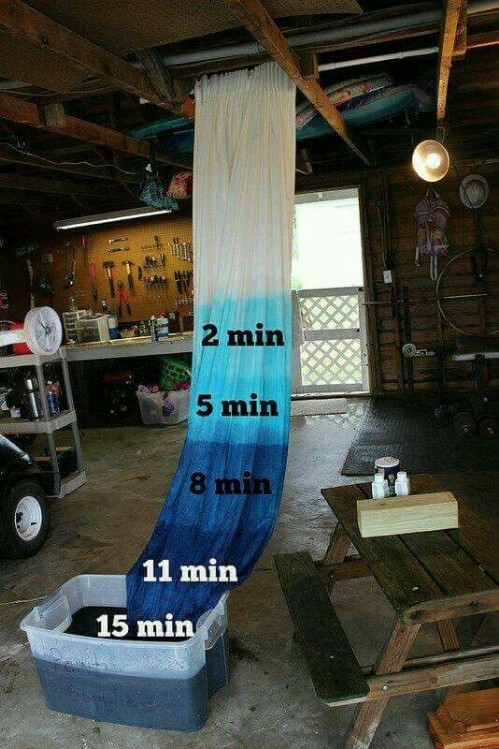 Here is a helpful image that teaches you a bit more about dip-dying. 25. 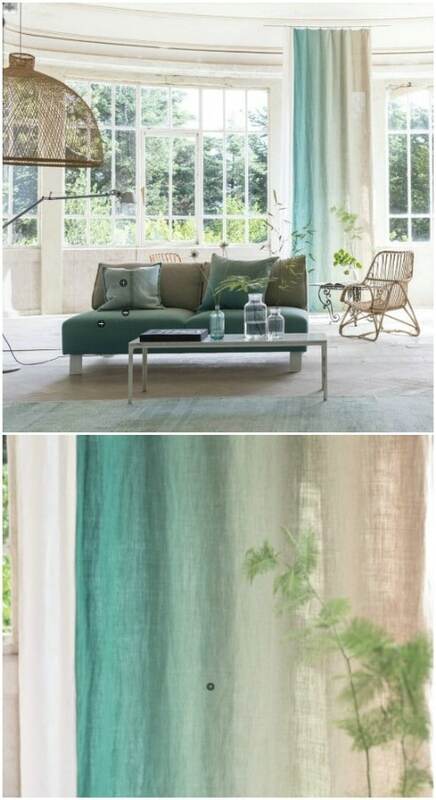 Do not be afraid to use a horizontal ombre spectrum on your curtains. 26. Sometimes hard edges actually work. 27. Dip-dying looks great on tablecloths too. 28. Ombre works well inside of cabinets too. 29. Ombre works beautifully on bookshelves. 30. Get subtle about ombre. 32. 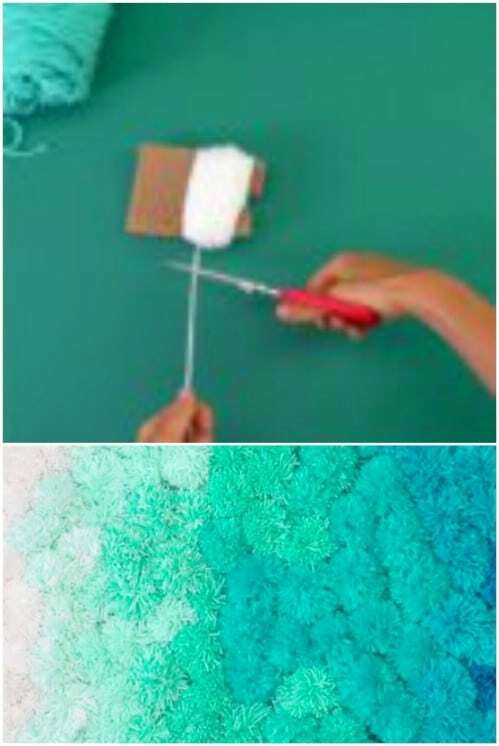 Make an ombre rug out of pom poms. 33. Make an ombre paper mobile. 34. 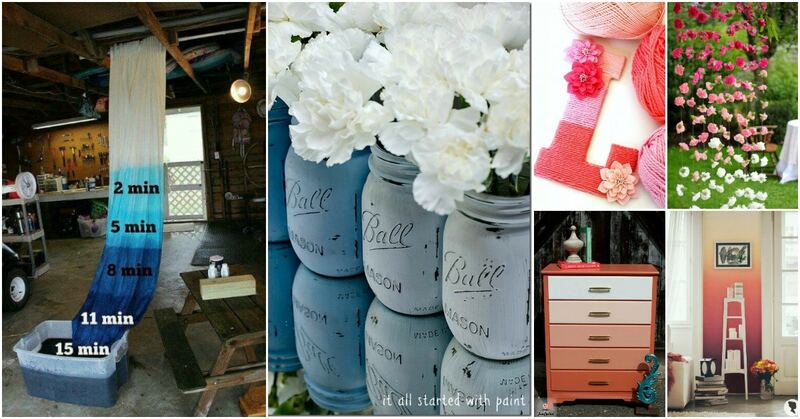 Spruce up your porch with an ombre pallet. 35. Cover a basket in ombre twine or rope. 36. Make a cute homespun sign in ombre colors. 37. 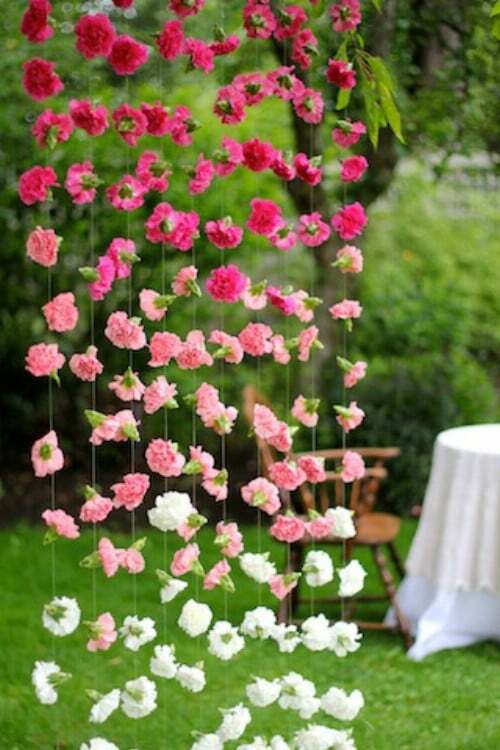 Make a flower garland in ombre. 38. Cover your wall in ombre hexagons. 39. 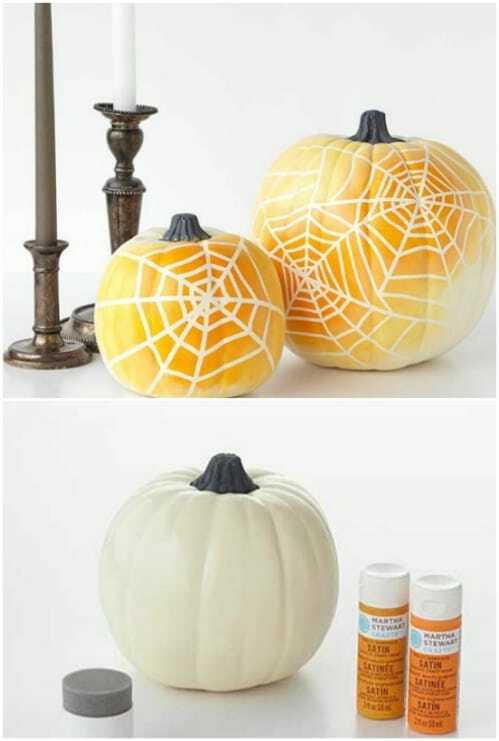 Make ombre spiderweb pumpkins to celebrate Halloween. 40. Here is exactly how you can paint an ombre dresser. 41. Why just go with one craze when you can combine three for triple the trendiness? 42. Here is more help if you want to cover your wall in an ombre gradient. 43. Make an ombre garland out of real flowers. 45. 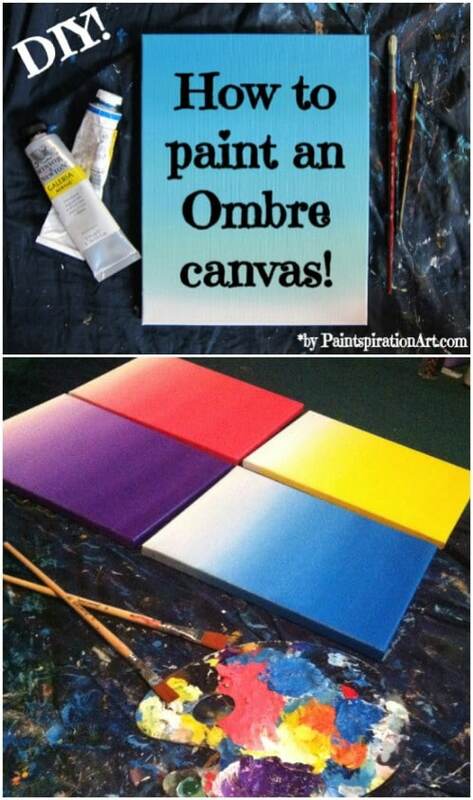 Paint an ombre canvas. 46. 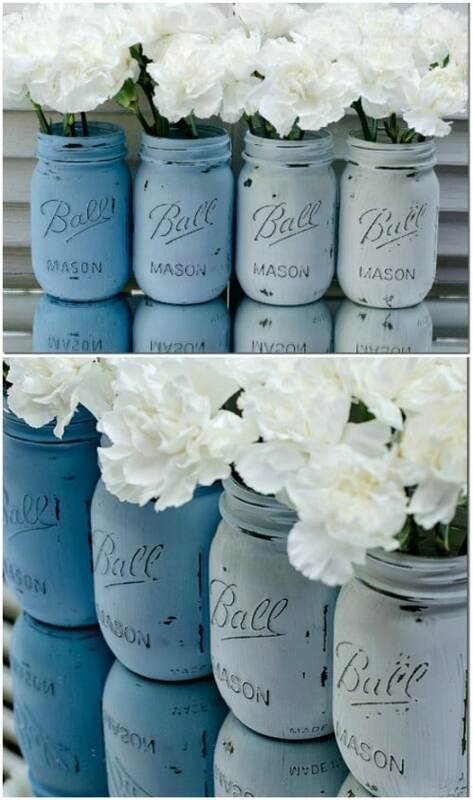 Make ombre mason jars. 47. 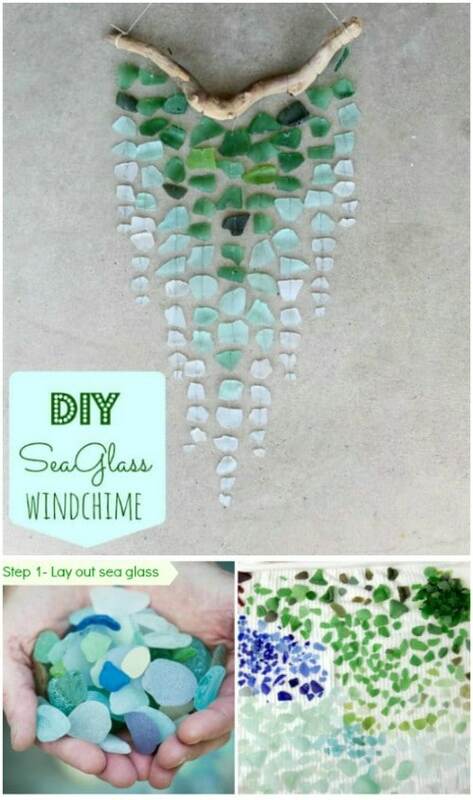 Make an ombre sea glass wind chime. 48. 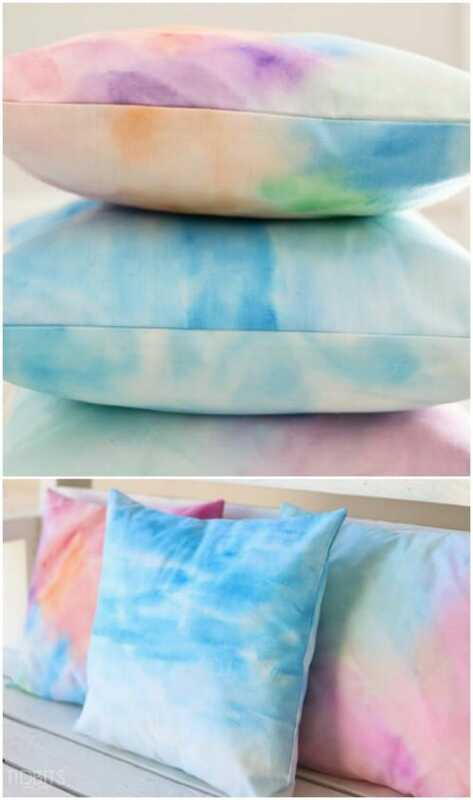 Apply watercolors to fabric to make ombre pillows. 49. Make a monogrammed letter wrapped in ombre yarn. 50. Make lifelike ombre butterfly wall art. If you don’t feel like painting your walls, but you like the idea of ombre walls, ombre wallpaper can do the trick! Just check out what a brilliant splash of sunset color this wallpaper is in a room with otherwise white décor. One of my favorite kind of projects to make is DIY home decor. You can never have enough decor. 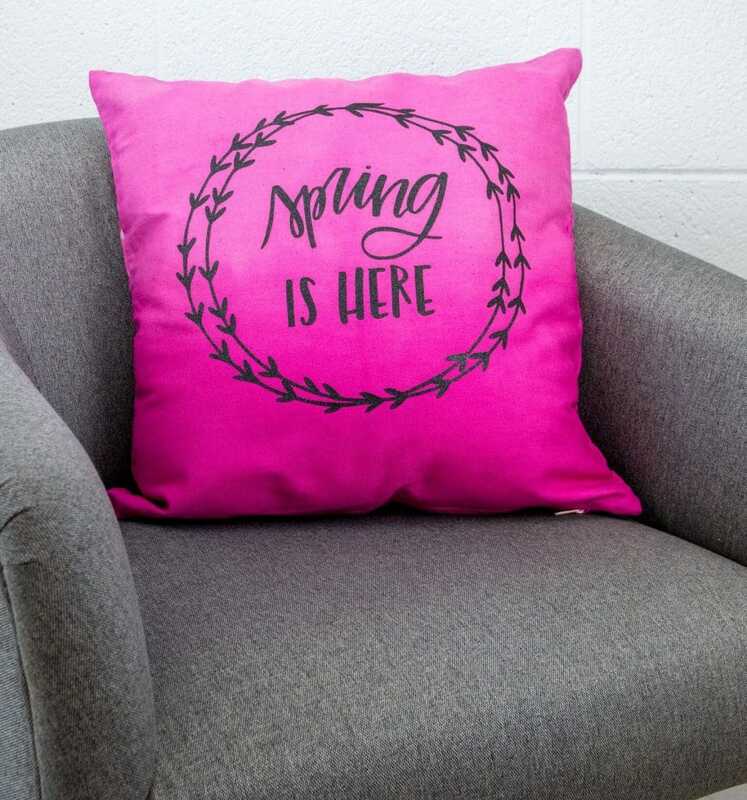 Today I’m going to show you how to make this DIY Ombre Spring Pillow. You will love the process and how it turns out. It’s kind of like tie dye in how no two are the same. I love dip dying and you will too! Click through to read a simple tutorial for painting your own ombre walls. 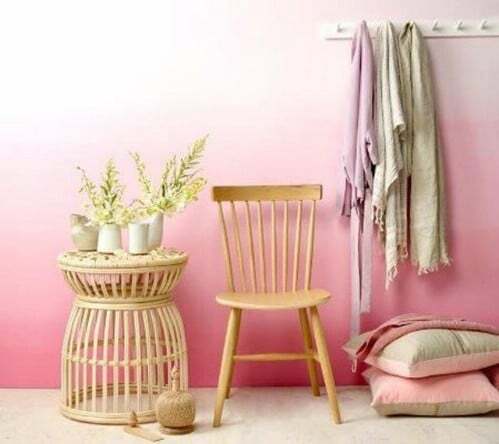 These sweet pastel pink hues would look lovely in any room, but would be particularly nice in a nursery or child’s playroom. 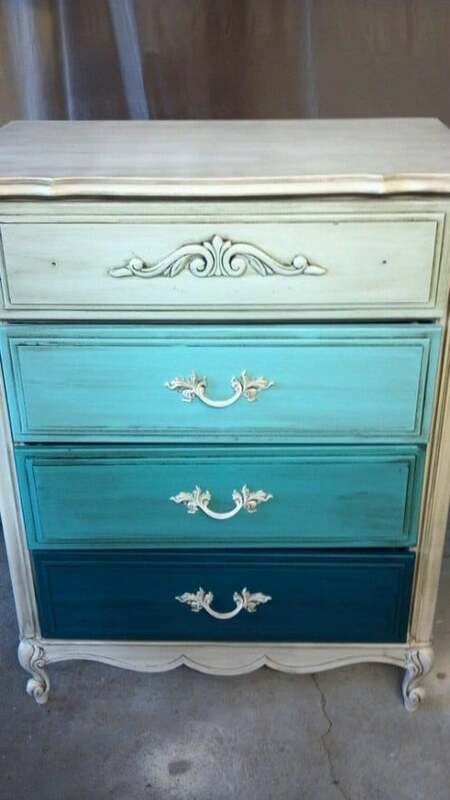 A dresser is the perfect choice for your first ombre project! You do not even need to worry about blending your colors one to the next. You will get the effect you are looking for just by painting each drawer an individual hue. Anytime you have a set of items, like kitchen utensils, you have something which you can paint in ombre hues. This really adds a lovely personal touch, and helps your utensils stand out amid your kitchen clutter as well. This is another particularly brilliant idea, since your radiator is something which has convenient “sections.” So long as you paint each segment a slightly different hue from the last, you should get a nice clean gradient of colors. 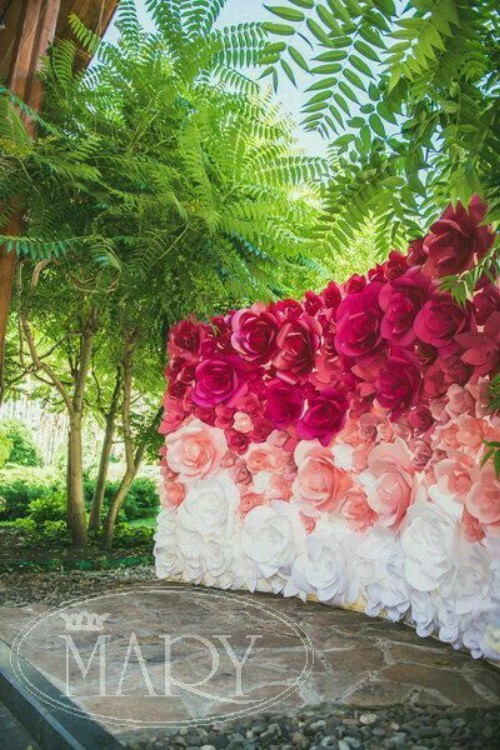 Here is a wall made of giant paper flowers arranged in ombre hues for a wedding. This is a brilliant wedding décor idea, but you probably could also use variations on it around your home (perhaps paper flower wall art?). These walls have an incredible nautical vibe. They perfectly reflect the look and feel of the sea. Together with the wooden steps, the picture on the wall, and some of the other design elements used, they immediately put you in mind of a vacation on a yacht. At the link below, you will find another tutorial for painting your walls. I particularly like this project because the walls use a medium tone, but the furniture and décor in front of them is white. This makes the furniture and flowers stand out against the backdrop. The colors are also evocative of an evening sky right around sunset. Here is a variation on the ombre dresser which I shared previously—only this one has a cute whale design on it which would look absolutely adorable in a child’s bedroom. The whale is in white, and is of course situated on the darkest drawer down at the bottom. This gives an abstract impression of sea and sky. The dark blue contrasts beautifully with the white, helping the design stand out. The lighter colors at the top also have a harmonious balanced effect in relation to the whale. All in all, a work of pure genius! Here is a lovely example where we have more than one color as part of an ombre gradient, but the transition is incredibly smooth and seamless from purple to green. 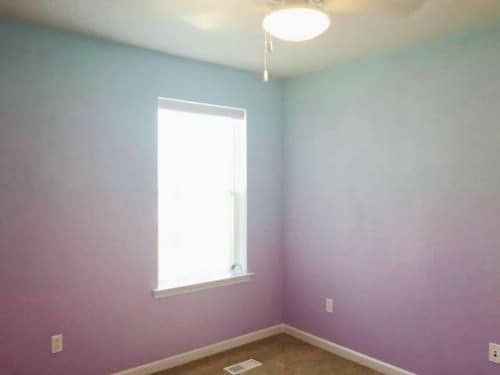 I can’t quite tell if the ceiling is painted as well. Here is an ombre wall which I am particularly mesmerized by. Dark purple shades transition to lighter colors with golden accents like lining on dark clouds. It has a lovely stormy appearance. This Pinterest user did a great job bringing color to an otherwise drab white interior. This is another ombre décor idea which features more than one color. The smooth transitions are lovely to behold. This isn’t one specific idea, but I wanted to share a link to a tutorial which helps you learn how to paint your furniture, walls, and anything else you want with ombre color transitions. Click through to check it out! You do not necessarily need colors to do ombre—you can do it from black to white through a spectrum of grays as well and achieve an amazing effect. Here is a different take on the whole ombre idea. Here we have an old-fashioned cabinet which features a distressed gradient of teal. This combines two popular design trends into one beautiful rustic package! Like the ombre look, but don’t fancy trying to blend shades? Just select several different hues which are close to each other, and paint a set of chairs with solid colors. This is a great way to get that same look for transition without learning how to blend. It’s the perfect gestalt effect. One of the cool things about ombre is that a lot of ombre color combinations are evocative of nature. This particular set of drawers features a paint job which is reminiscent of a sandy ocean shore. The visible paint strokes actually serve to further this effect, because they are similar to the look of painted waves. 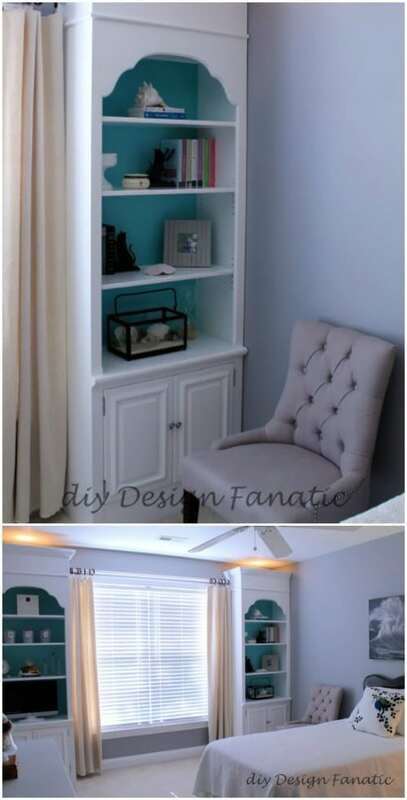 Most of the time, ombre paint jobs are applied to dressers. But you can also use the same techniques on any other furniture items in your home, including a glass display cabinet like this one. Seriously, if you cannot decide on a hue to paint your drawers, you should think about going with teal or aqua or anything in that area. 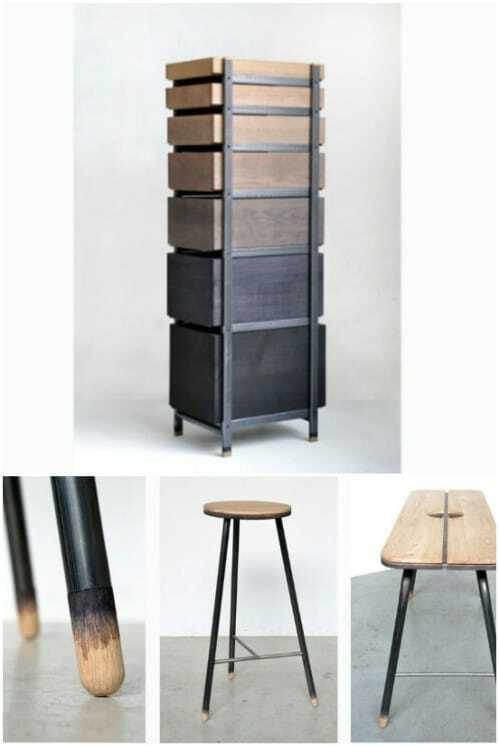 This is all the rage right now, accounting for about half of the ombre ideas I’m finding for furniture! Even though muted or pastel hues are typically used for ombre paint, you do not have to stick with these colors! Sometimes you can get an awesome look by going with super bright colors. This is a seriously bright shade of aqua, but that gives it a whimsical, playful look—especially with that cute checkered handle. I recommend checking out the post in the link below so you can find out more about how it was done, and check out additional photos of the cabinet’s interior. Believe it or not, this detailed design was made with the aid of masking tape! With the light gradient of colors, it has a very luminous, light, ethereal look. Visit the link below to view a tutorial and learn how you can apply this technique to your own ombre paint jobs. 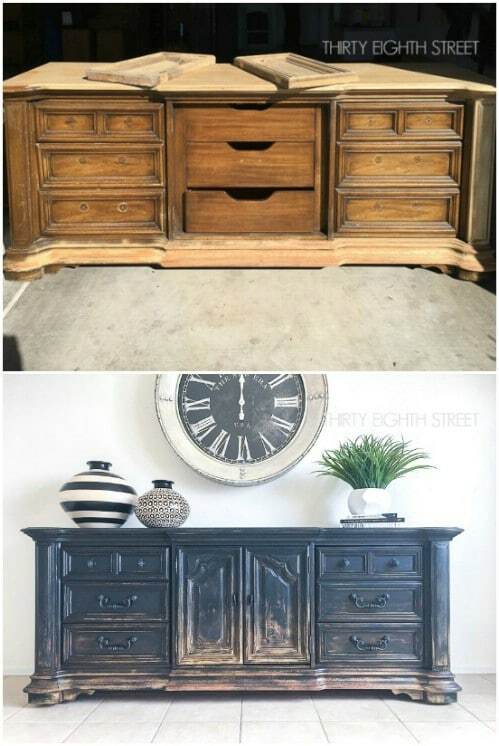 I am just in love with this dresser! The teal again reminds me of the sea, and the ornate embellishments in the design kind of make me think of waves along the sides. The dresser is also beautifully presented in this picture. You might be familiar with the dip-dye technique for hair dye, popular among ombre fashion enthusiasts. 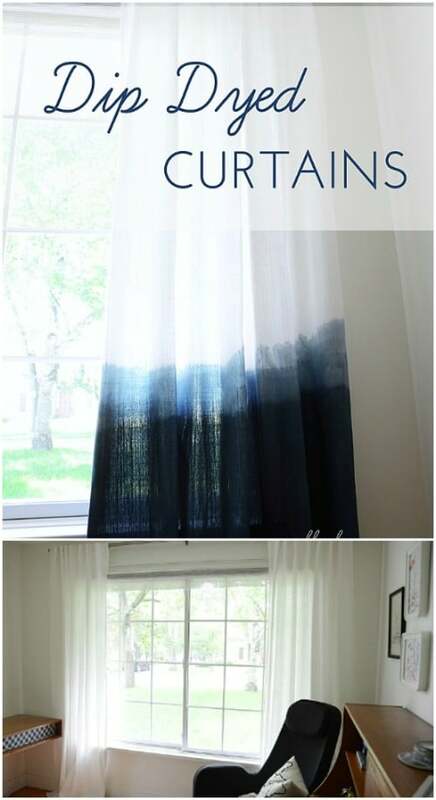 But did you know you can also dip-dye your curtains? Check the link below to view a tutorial! You do not necessarily need shades of blue (or any other color) and white to blend together to paint your curtains ombre—that is actually why dip-dying is such a handy technique. Basically, the amount of time you leave the fabric in the dye determines how dark a color you get. So you can start by putting most of the curtain inside the tub of dye, then pull it out a little at a time, which will give you a gradually darkening gradient toward the end that stays in the longest. Almost all the curtains I have seen which have been painted with ombre colors have the hues arranged vertically—darkest at the bottom or (sometimes) the top. But you can actually achieve a lovely effect by doing the shading horizontally. It’s a unique look that a lot of people don’t even think of trying out! Usually you want a nice smooth gradient with ombre, but you do not have to go for that look. Sometimes harder, more defined edges actually look quite cool. This can work well in your home, and it can add some color and pizzazz to event décor as well. If you are decorating for a wedding, you can use the same colors which are incorporated into the rest of the theme to help unify the look of your reception. On the outside, this just looks like a plain old ordinary cabinet. But once you open the doors, you are greeted by a cheerful gradient of hues which contrasts exquisitely with the pale color of the doors. Here is a bookshelf which originally was unpainted. The white makes for a beautiful contrast with the shades of blue that were used for the interior of the shelves. Visit the link to view more pictures and learn more about this lovely transformation. This dresser has almost entirely been painted a dark blue—but there is some tan worked in toward the bottom, almost more like a suggestion a gradient than a full-on gradient. Because of the contrast in the colors, it almost gives the dresser the illusion of being lit by a mysterious glow from the bottom. This cabinet (is it a cabinet?) was not painted with these different hues. Instead, the unique effect was created by exposing oak (which contains tannic acid) to certain chemicals, resulting in a reaction creating a dark blue color. Check the link below to see other furniture items which artist Steven Banken has treated using the same technique, and to see a video about how he did it. If you are looking for one of the easiest ways to make an ombre rug to add some color and cushioning to any room of your home, try using pom poms in closely related hues. You can either purchase pom poms for this purpose, or you can make them yourself using yarn. Visit the link for a tutorial to learn how to make a beautiful rug like this yourself! Here is another idea for ombre décor which is completely different from anything else I have shared so far. Make a beautiful ombre mobile that you can hang anywhere in your home! This project is easy to customize with any colors you want. Visit the link to learn how to make one. Sometimes the simplest décor ideas are the most brilliant ones—like this ombre pallet in fall colors to celebrate the arrival of the autumn season. Add some other fall décor, and you have a great look for your porch or patio. Believe it or not, this beautiful ombre basket started out as nothing more than a plastic container! First the rope was glued onto the container, and then it was painted with an ombre metallic gradient. Check the link for a full set of instructions. Signs with sweet sayings on them are very fashionable right now, and a fun way to personalize your décor and add a little extra meaning to any room in your home. This ombre sign is particularly effective since the shades of blue and white convey the idea of the sea—much like the ombre wall in aqua hues that I shared earlier in the list. Here is a project I think is just spectacularly beautiful. You can buy one of these hanging garlands on Etsy, or you can craft your own. If you zoom in, you can see that each of these little “blossoms” is just tissue paper. The gradient of hues is gorgeous! Use this as wedding décor or just hang it in a room of your house to beautify it. I just love hexagons in décor—probably because they remind me of beehives, and I like insects. 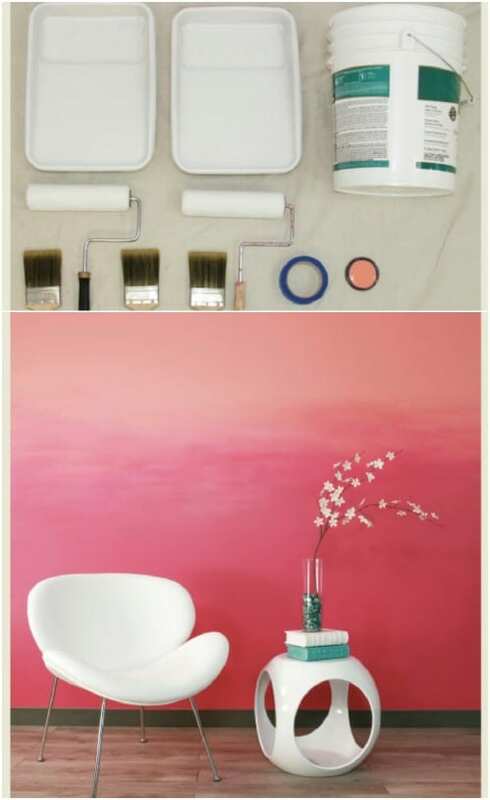 Anyway, this is yet another approach which you can take to making your walls ombre. To do this project, you tape patterns on your walls, and then paint inside the hexagons. The tape creates the white lines between them (when you peel it off). The result is a gorgeous series of ombre hexagons. Check the link for a full tutorial. Just in time to welcome in fall, here is a project which teaches you how you can make ombre pumpkins featuring spiderweb patterns. These pumpkins are elegant enough you can fit them in with any décor beautifully. Ombre dressers are so popular because they are so easy! 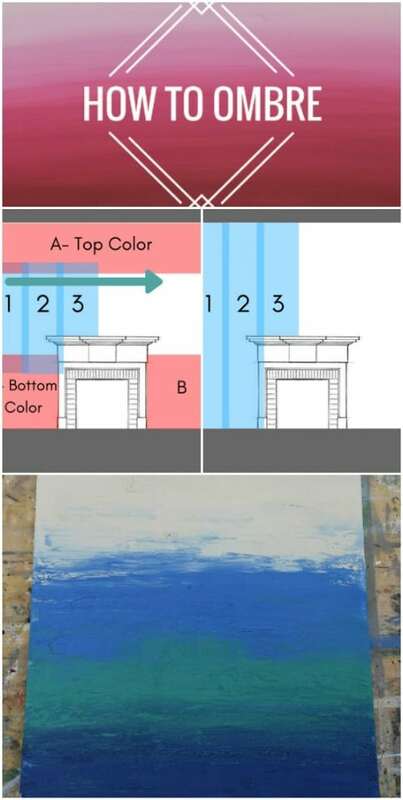 But in case you are feeling lost with how to mix your paints to get a perfect smooth gradient from top to bottom, this image shows you exactly what you need to do. Just substitute in any two colors you want to use! Paint chips are fabulous because of course they come in a huge range of colors and it is very easy to arrange them together in a variety of projects to get an ombre effect. At the link, you can find out how to create this easy-yet-mesmerizing ombre wall art. While it’d look beautiful in any colors, the blue really works with the chevron designs since it reminds one of the ocean. 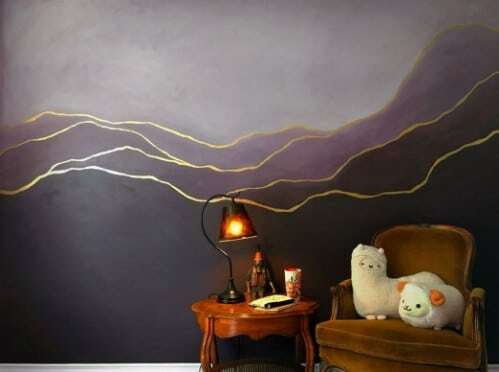 At the link is one of the best tutorials I have found yet for ombre wall paint. Check it out to find out exactly how you can achieve a smooth and flawless effect! Remember the paper flower garland idea I shared with you earlier? Here you can see the same idea with real flowers—a great idea if you are decorating for a wedding or another special event! Seriously, there is nothing which cannot be improved through ombre dye! 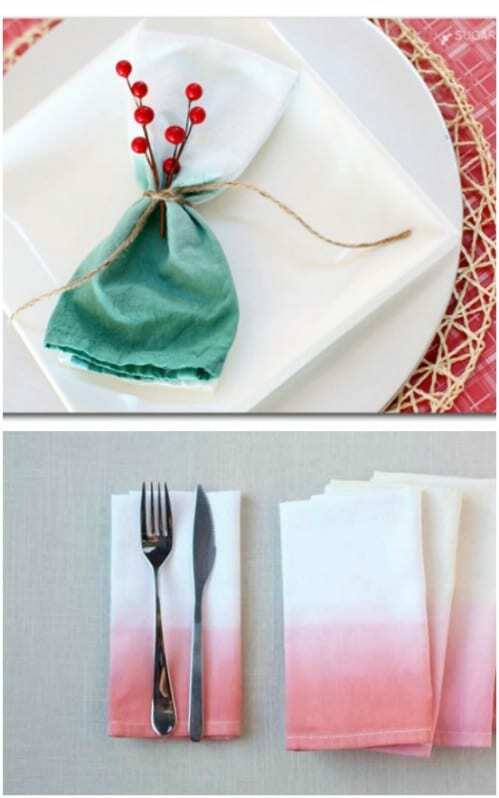 Here is an easy project which teaches you how you can dip dye your cloth napkins. Once they are finished, they can add some color to your place settings. Once you have an ombre canvas, you are ready to turn it into any sort of fabulous wall art you choose. There are no limits here—just let your imagination guide you and create something amazing! Back on the subject of combining trends … if you love mason jars, why not paint them in ombre hues and line them up next to each other? It makes for a charming rustic effect. Beach glass comes in most shades of green, ranging from very dark to very light (you can sometimes find it in white as well). If you order sea glass in all these different hues (it would take you ages to collect it on your own), you can fashion it into a lovely ombre sea glass wind chime. Think how great this would look against an ombre wall painted with sea colors! Check out the tutorial in the link below to find out how you can create watercolor ombre pillows like these. Don’t they look just magical? They remind me of clouds and sunsets. A monogrammed letter can make for a cute decorative item anywhere in your home—and it can also make a great gift. At the link, you can read a tutorial which teaches you how you can make one with lovely ombre hues. Finally, last but certainly not least is this stunning ombre butterfly wall art. While it looks tricky, it is actually quite easy, because you are really just cutting out a bunch of identical butterflies from pieces of paper and gluing them to a canvas. The key is to arrange them so that they look ready to fly away. Now you have seen 50 great ideas for ombre décor around your house. Whether you ombre your walls, your curtains, your pillows, your tablecloth, or other items around your home, ombre can add a touch of color and refinement to your home. Thank you Vanessa, another DIY that you gave your all and hopefully is appreciated by your followers. sure how the look was achieved. Now looking forward to using this decorating technique. Hello, You really helped me out with this blog. . I have a shower curtain that is the teal to white ombre. I wanted to do a couple of things to accessories. I plan on doing this effect on the old trash can, soap disp.,toothbrush holder, ect. Plus I thought That I might do a canvas the add sea shells to it. I am using the beachy them . It is for a beach house bath. What do you think? Any additional input is welcome. Maybe I can share photos when finished . Thanks again for your help.